TotalMix FX is RME’s powerful routing and mixing control software. 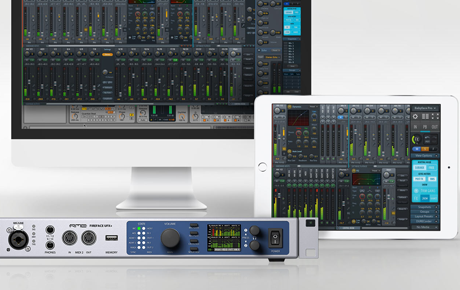 Included free with all RME audio interfaces, TotalMix FX enables you to carry out a wide range of tasks such as setting up additional monitor mixes; switching back and forth between different sets of speakers; routing audio back to the inputs for further processing via a ‘virtual patchbay’; and applying effects like EQ, compression and reverb. Arguably the most powerful software controller available, TotalMix FX is relied on by audio professionals around the world on a daily basis, both for live and in the recording studio. If it’s your first time owning an RME interface however, you may find TotalMix FX a bit of a head-scratcher at first, especially if you’ve not worked with a monitoring controller or routing matrix before. To help new users get to grips with TotalMix FX, RME recently put together a new introductory series of video tutorials, designed to make the application more accessible and to simplify some of the concepts. We’re sure after you’ve watched the following videos, you’ll soon feel a lot more confident in using your interface for recording and monitoring. 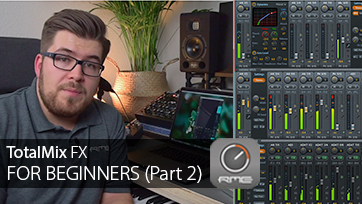 In TotalMix For Beginners Part 1, RME’s Adrian Lehmann took us through tasks like how to route audio channels from the inputs to the outputs; how to customise the channel layout; how to save setups with snapshots and workspaces; and how to make making your first recording with an RME interface. Now in part two, Adrian takes us through setting up a monitor mixes for both your main speakers and headphones; using the unique Trim Gain function to provide a master input control (when routing simultaneously to multiple outputs); and how to print your effects using TotalMix FX’s ‘Loopback’ feature. So if you want to get the most out of recording and producing with your audio interface, check out the videos below. If you have any suggestions for future videos, or if you have a specific question that you’d like to see answered, then let us know and we’ll pass your questions and ideas for future videos on to Adrian.